The exhibition titled Nota brings together four visual artists Weaam El-Masry, Shaymaa Kamel, Hanan El-Sheikh and Eman Osama, to create works inspired by The Prophet, Kahlil Gibran’s book of 26 poetic essays. The artists searched for literary material that offered flexible content to draw inspiration from. Ultimately they chose Gibran’s The Prophet, which was suggested by El-Masry as she felt the work poetically tackles the realities of human existence. Prior to the exhibition, the artists spent months working from the Arabic translation of The Prophet, and organising talks with Hala Fouad, a philosophy professor at Cairo University and Sufist speaker, to discuss the book. Working independently and producing solo projects that sometimes overlapped in concept and other times not, they created what they considered to be visual notes, hence the exhibition title Nota, which is Arabic for notebook. The final display, held at the space inside the aged Hotel Viennoise, is curated by Easel and Camera, an online gallery funded by El-Masry and her brother. 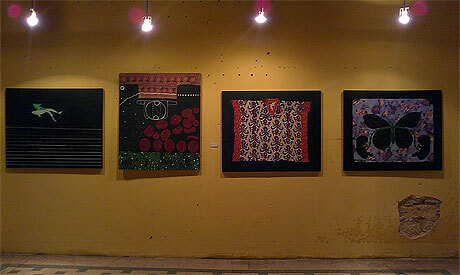 The exhibition began 10 December and will continue until the 24th. In her works, El-Masry remains perhaps the most faithful to the exhibition title. She uses watercolors, ink, mixed media and pen on canvas to create elaborate sketch-like pieces. There is often text on the paintings, her hand-written notes from a dictionary, with multiple definitions of words merged with the large human figures in the foreground. “I started by very systematically surveying the book, expanding and mapping out the words that pique my interest from the text,” the artist told Ahram Online. El-Masry added that she chose transparent ink colors to record her process on canvas, and allow for a visual representation of the build-up of her thoughts. Her repetitive pen strokes depicting the figures add to the sketchy feel, giving the sense that she was thinking while drawing, making their bodies look dynamic, as if their outlines are vibrating movement. The majority of El-Masry’s pieces are accompanied by quotes from the book or a few sentences by her that shed light on her thoughts. Presented with diaries from her life, one discovers how El-Masry used the book as a catalyst to look inwards and explore herself allowing her pieces to act as evidence of her self-reflection. In her piece titled Panic Attack, she tries to analyse the way she reacts in certain situations, seeking definitions and using words as gateways to answers. Another of El-Masry’s pieces is collaborative with her six-year-old son, with his child-like drawings juxtaposed with her skilled figure drawing. The untitled piece deals with the questions of freedom, a theme Gibran evokes in his book. “Is it freedom of the body, or freedom of the soul like that of a child?” she asks. On the similar issue of freedom quoted from The Prophet, but in striking visual contrasts to the other artists’ coloured works is Hanan El-Sheikh, with her black and white drawings. Her process for creating the artwork however differs. El-Sheikh embraces the book and lets it influence her, then allows it to appear in the art she produces. “After all, he speaks to things that are already within us,” El-Sheikh says about Gibran. For five years El-Sheikh has been drawing matchsticks, after finding in their Arabic definition the description of something more than that which explains an object; rather she noticed a human element. She has since seen them as her subjects, placing them as models with lighting and capturing their delicate lines. For Nota, she continued using the matchsticks as figures in a series titled “Wa Mada Al-Qawm,” responding to parts of the text that dealt with communities and evoked imagery of masses of people. In another series, El-Sheikh tackles Gibran’s musings on Crime and Punishment. For this topic she draws crows in charcoal, the generally disliked black bird that, to the artist, is a personal charm of good luck. “Crows are a highly intelligent community, did you know they hold a conference when one of them steals from another’s food or flirts with another’s wife to decide his fate?” the artist says, elaborating on the series’ connection with the text. For Shaymaa Kamel, the book brought up new meanings each time she picked it up, putting her thoughts in constant state of flux. Her pieces were reflections on Gibran’s themes in the book, expressing the meanings of children and happiness among others. One of her pieces is a child’s dress, white and glued on to a dark background on which she painted a simple outline of a body within the garment. Another collage piece features a black cat jumping for joy. Kamel’s mixed media work often tackles altered meanings in society, “I sometimes use a sense of humor to critique absurdities I find, and meanings that are upside down, like religion,” she says. Gibran’s The Prophet was received as a cult-work, becoming a sort of bible for American counter culture back in the 1940’s. The work presented the contradiction between Gibran viewing himself as a Maronite Christian while also doing things in the name of religion that he could not accept. In his writing, he addresses religion as a personal quest, free of any dogma, making itself available to anyone, Christian, Muslim or Jewish. With no quotes or textual elaborations, Kamel communicates her fluid experience of the book, her response to the meanings evoked in the text. Eman Osama created a mystical world of green-skinned women in florescent flower blossoms. Osama’s paintings, where she quotes the book on beauty, friendship and women’s freedom, depict graceful female figures not unlike Gibran’s own symbolic women. Less is known about Gibran’s work as an artist since he became considered a prolific writer. He was trained in the symbolist movement under August Rodin in Paris and other big names of his time. In everything, he sought beauty and poetry, and through symbolism visually conveyed spirituality, something Osama’s pieces similarly achieve. It would be interesting to hear an event comparing the Christian Gibran with the Muslim Rumi. The two present examples if how two different religions can share the same values and coexist away from their institutions. I thought importing copies if The Prophet had been prohibited when some copies were to come from Lebannon?